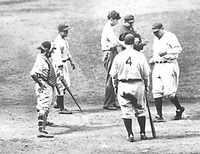 While instances of baseball teams wearing numbers on their uniforms date as far back as the 1880s, and the Cleveland Indians began doing it regularly in 1916, the practice didn't really take off until the New York Yankees in 1929 assigned numbers to their player corresponding to their position in the batting order (Ruth 3, Gehrig 4, etc). By 1932 all teams wore numbers. Common tradition holds that position players are generally assigned numbers below 25 and pitchers above 25, though exceptions to this practice have always existed. Largely due to the whims of the players, its not at all unusual to see a few nontraditional numbers assigned (Brian McRae's 56, Rey Ordonez' 0 or Turk Wendell's 99 to provide three examples in recent Mets' history). Numbers lend the only uniqueness to players that otherwise are all dressed alike. And because only one player can wear a particular number at a particular point in time, a number often defines a player's moment in team history. Isolate the number, and you have a broader history -- what Vonnegut called an "artificial extended family" linking one player's moment to the next's. Today's Luis Castillo is yesterday's Mookie Wilson is yesteryear's Richie Ashburn. As such this project was designed as a kind of guided history, using numbers instead of years to form and follow the history and ongoing progress of the team. This site first went live on Feb. 22, 1999. It has been updated and redesigned often since then. It has resided at its own address since 2003. A visitor once described MBTN as "an online coffee table book." The site over the years has garnered acclaim from the Wall Street Journal, Mets Inside Pitch and Paul Lukas' Uni Watch, among countless links and references on the Internet. Sometime in 2006, with a new baby at home and several freelance writing projects on the schedule, I decided the site had become far too unweildy to manage "by hand" and began to look into creating a web-based database that would help manage this data, integrated with a "blog-like" interface that would allow for faster and easier updates and additional forms of content (longer stories, interviews, etc). This itself turned into a giant project that went way over budget and way past deadline but was finally completed in early 2008. The site in the in between gave birth to a book, also available in early 2008 from Skyhorse Publishing. Although based on the website, and in embryonic development for five years, the book, co-written with Met historian Matthew Silverman, contains a lengthier historic review, information and perspectives on the history of the uniform not included on the site and for the first time, publishes statistics based on mbtn.net's proprietary research. My name is Jon Springer. I was born into Met fandom on Long Island in 1966 and attended my first Met game in 1971. My clear memories begin in 1973, when I started collecting baseball cards and got swept up in the “You Gotta Believe” season. My loyalty would be tested often since then — particularly through the unpleasantness of the early 90s teams and the ‘94 strike — but I resolutely stuck with the Mets through the few rewards and many frustrations they provided me. My father Frank was born in Queens and rooted for the Dodgers until they left town. 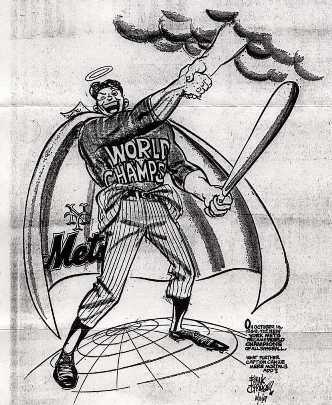 Among his gigs as a freelance illustrator was covering the Mets for the Suffolk Sun newspaper in 1969. Pictured here is a cartoon from the Oct. 17, 1969 issue (”Not my best work, says the artist). Between the old junk he and my older brother filed away I began researching this project with a good deal of material from the 1960s. In “real life,” I’m a journalist, retired ultimate frisbee legend, husband and proud Dad. We live in Brooklyn and endeavor to obey most of The Greg Commandments. At first, this project was essentially a matter of transferring data from my head to the computer. While I have virtually no facility with numbers as they relate to arithmetic, I have always managed to connect numbers to Mets and back again as a way to remember locker combinations, phone numbers and pin codes. But when it came down to putting it all on paper, my memory wasn’t nearly as accurate as I thought it was. Was Darryl Boston a 6 or an 8? Felix Millan… a 16, 17, or both? To find out, I scoured all the old scorecards, yearbooks and baseball cards I could find. I was surprised by the multitude of players who wore more than one number and among the most difficult things was figuring out just when the player switched. To cut down on confusion, I ignored Spring Training numbers and concentrate instead on those they wore during the regular season. However, if a player was on the active roster in-season I have included them, whether or not they played a game (Jerry Moses in 1975 and Mac Suzuki in 1999, for instance) since they occupied a number. Over the years this thing has existed, it’s morphed from a disorganized, inaccurate collection of memories to a legitimate research project, capable of withstanding some historical scrutiny. For this I owe a ton of thanks to MBTN readers like Jason and Ed, whose personal collections of Met numbers and history have been extremely helpful and helped me to see the uniform number for the link to history it is. David Moore helped the web project come to life again with heroic job of mop-up relief, earning the win and the save. The New York Public Library and SABR have offered great research resources and people. Mostly I owe people I’ve never met who yet have shared their memories, scans and help via email or through the late Mets Online and Crane Pool websites. Ernie Alston has provided several corrections and minutae. Dennis D’Agostino’s 1981 classic, “This Date in New York Mets History,” provided a number of surprising yet accurate discoveries. Chris in the Mets’ PR Department, Jason from South Jersey, Irv, Jonathan S. “52″ Weissman, Matt Silverman, Mark, the talented Greg W. P., Ellis, Glen, Mike J, Mark in Japan, KC, Jack, Ed A, Dave from Retrosheet, Pete M., Kasey, Charles, Lou, Matt 2, Keith and still others.